Lisseweegs Vaartje. 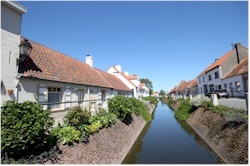 This narrow canal runs through the village and connected Bruges with the sea. It was used for the transportation of materials (such as natural stones for the construction of the church) to the village and as a local trade route. Railway station. The railway station of Lissewege is a typical example of the type of stations that were built at the end of the 19th, beginning of the 20th century by the Belgian railroad company. It has been recently restored but no longer functions as a railway building. Note that this is still a functioning stop on the track Bruges-Zeebruges. The Polders. Lissewege is a typical "poldervillage", surrounded by the flat, fertile, green polders that were reclaimed on the sea. It is ideal terrain for walking or cycling.